Serving as the apparel chair in my sorority sparked my interest for wearable designs. Using my favorite program (Adobe Illustrator) I've been able to craft a series of custom shirts and accessory designs for various organizations. Take a look a few of my favorites! Most of my designs started as a sketched illustrations, which were then transferred into Adobe Illustrator. Working with apparel companies, I was able to be the liaison between the apparel company and the sorority. 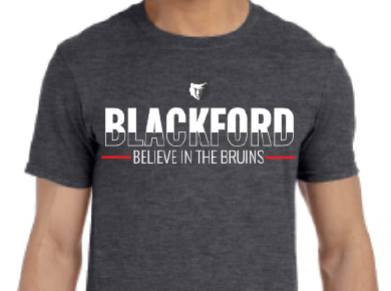 From then on, I was able to take what I've learned to produce apparel and swag for other organizations. 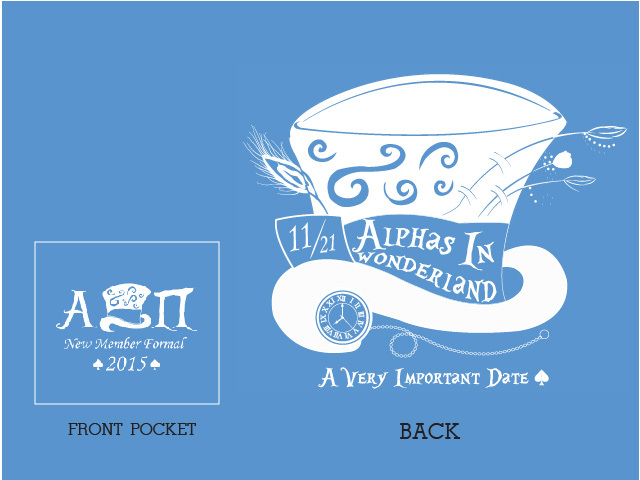 My sorority's formal was a spin on Alice in Wonderland. I drew this design first and then used Illustrator to make it come to life. 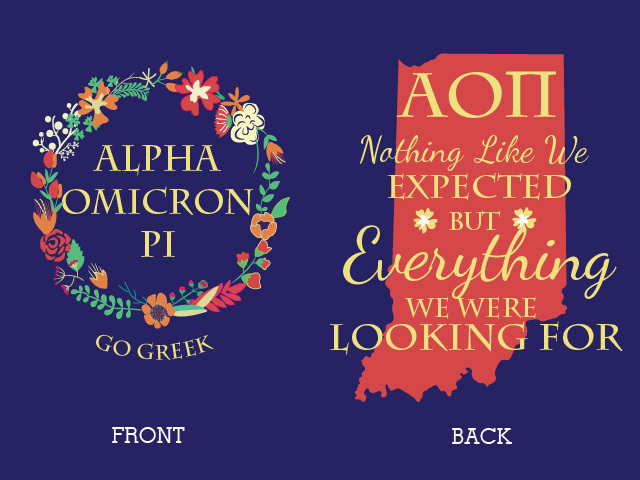 For the beginning of the school year, Alpha Omicron Pi (AOII) comes out with a PR tank to promote their sorority before recruitment. Using a similar design, I traced a few of the flowers to create a floral ring and created a completely custom back of these tank tops. Once a year, all of the greek life on Ball State's campus gets together to compete in a series of competitions that benefits a non-profit. The theme for this Greek Week was Survivor. So, I took a spin on the Survivor logo and made it relative to Greek Week. Bid Day is almost as good as Christmas to sororities. My senior year of college, my sorority decided to have a lifeguard theme. In order to make the theme come to life, I illustrated these shirts. 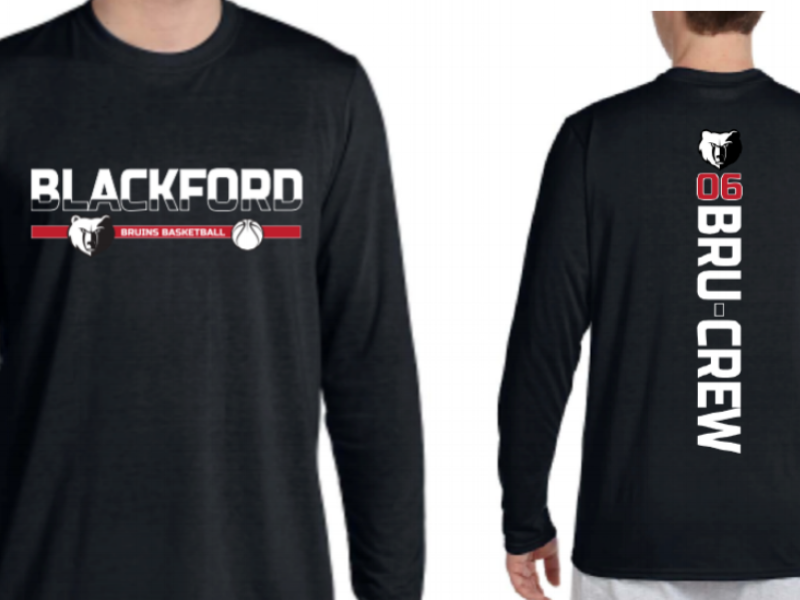 The Blackford High school Booster Club asked me to design a series of shirts to be able to sell to the students and the public. 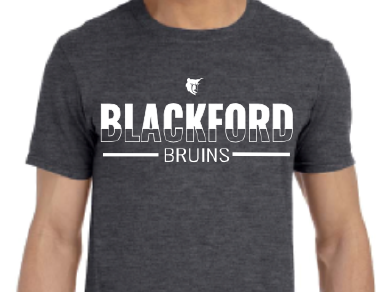 As an one of the many alumni from Blackford, I was so excited I was able to give back to the school. This was a shirt that I never sent to the t-shirt press, but I had a lot of fun designing. Every circle and swirling detail was illustrated in Illustrator.